Somali militants have threatened football fans they will be publicly flogged - or worse - if they are caught watching the World Cup on TV. 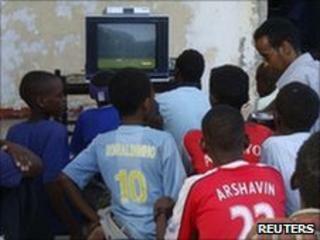 "We are warning all the youth of Somalia not to dare watch these World Cup matches. It is a waste of money and time and they will not benefit anything or get any experience by watching mad men jumping up and down," he said. One broadcaster has moved their operations to the fortified airport to protect their equipment from attack during the tournament. Dedicated football fans have few safe places to go if they want to watch Africa's first World Cup, with the al-Qaeda inspired group al-Shabab also announcing a ban. A cinema in the small part of the capital Mogadishu controlled by the government has become a popular place for football fans. One man, who lives in the militant-controlled livestock market area of the city told the BBC he was watching Algeria v Slovenia at home with his family. "I have one eye on the TV and the other on the door, and the sound turned down," he said. The ban dates back to a law that was introduced by the Islamic Courts Union who took control of much of Somalia for six months in 2006. It bans Somalis from all forms of entertainment considered un-Islamic under the courts' strict interpretation of Sharia law, like video games and watching sports in public. The BBC's Mohammed Olad Hassan says few individual Somalis can afford to have a satellite TV, so such public screenings are often the only way matches can be seen. In the Juba Valley rebel militias went further, saying young men should not watch football - even in the privacy of their own homes - because it would "distract them from pursuing holy jihad." A private broadcaster moved its equipment from the rebel-held Bakara market to the heavily protected airport so it can continue broadcasting, news agency Reuters reported. They had to do it under the cover of darkness for fear of attack, they said. Television was already under attack from the Islamist militants. Al-Shabab has declared Universal TV "enemies of Islam" because they allegedly broadcast pictures of the prophet Muhammad. Al-Shabab has already banned radio stations from playing music and threatened several radio stations. The Islamic Courts Union was driven out by Ethiopian-backed government forces. But since then rebel groups like al-Shabab have taken control of the south of Somalia and much of Mogadishu. The government, backed by African Union peacekeepers, controls only a small area of the capital.